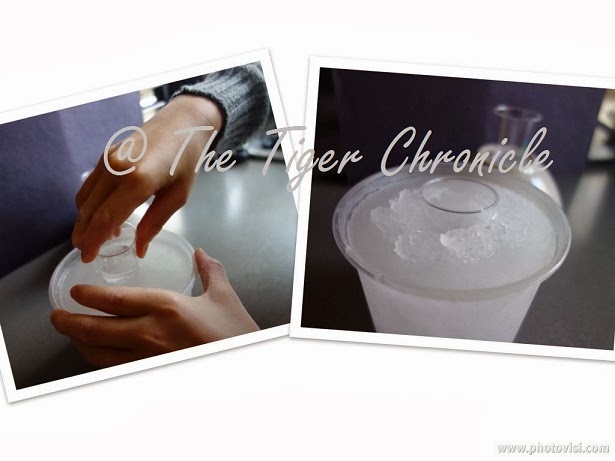 The Tiger Chronicle: Water is Super Cool! Since there has been so much rain, we continue our rain study by using a science kit that we had picked up at a charity shop that is relevant for our purpose. There are 25 experiments to do with this kit, but not all provide new learning experience for us so we only did those what looked interesting and taught us something new. The first experiment we did was to find out whether all liquids weigh the same. To do that, we prepared two jars of warm water -- the jar on the left has several tablespoons of salt added to it. We then gently put each egg into the jar. The egg in the salt water jar floats because salt water is denser than plain water, so the weight of the egg does not have to push away or displace as much water to make space for itself (compared to the egg in the plain water), therefore it floats. I think this can also be explained by the differences in molecular structures between salt water and plain water, but we will come to that when we learn more of chemistry. For the moment, the above simple explanation is enough for us. The next experiment has to do with mixing oil and water. 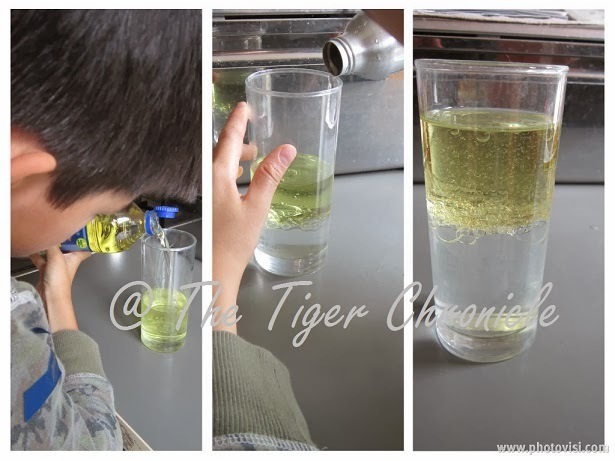 First, Tiger half filled a glass with cooking oil, then topped it up with plain water. He observed that the oil found its way up the glass and floated on top of the water. This is because water is less dense than water. We wanted to find out whether salt affects the freezing point of water, so we filled two containers with cold water and added a teaspoon of salt to the one labelled with "S". Both containers were put in the freezer and checked every 15 minutes for their stages of turning into solid. Ice crystals started forming in the plain water container after 30 minutes, while nothing happened with the salt water in the same duration. After 90 minutes, the plain water had become solid ice while the salt water was still in liquid form. The coolest thing we found out was about supercooling. The gist of it is to bring water to a temperature below freezing point while maintaining its liquid form, then turn it into frozen ice instantly. In the natural world, this phenomenom happens in the clouds in the northern hemisphere during winter for rain to form. It is too cool to miss, so we decided to try it out for ouselves. Alas, the cool factor eluded us. We couldn't make the experiment work despite numerous attempts. This is an experiment where we made a cascade of slow flowing water using the attraction of water molecules and surface tension. We wet a piece of cotton string then tied one end of it to the jug handle. The jug was filled with water. The other end of the string was held taut against a small jar. 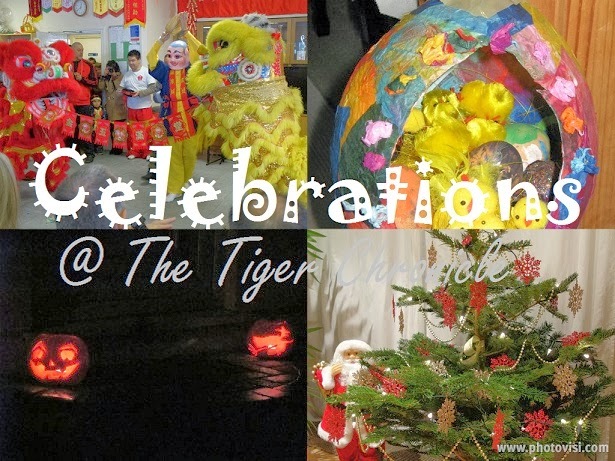 Tiger then lifted the jug so that the string passed over the spout. The water was poured gently. If you look carefully in the clip here, you can see the water flowing along the length of the string into the jar. The reason for this observation is because the wet string attracts the molecules in the water while the surface tension creates a skin on the outside of the water. The activities we did at home were supplemented with a hands-on workshop at a water treatment centre where the children did additional experiments related to water and recycling. A simple experiment is to drop a few drops of water onto different types of materials to find out which material is the most absorbent. which type of earthy material (gac, sand, or gravel) is the most abosrbent. which type of earthy material (gac, sand, or gravel) is the most permeable. As the facility we went to is a part of a water treatment centre, recycling naturally forms part of the education programme that was on offer. One of the experiments the children did was to find out why they should only put toilet paper (rather than other paper materials) down the toilet. To do this, three pots with plain water were prepared. 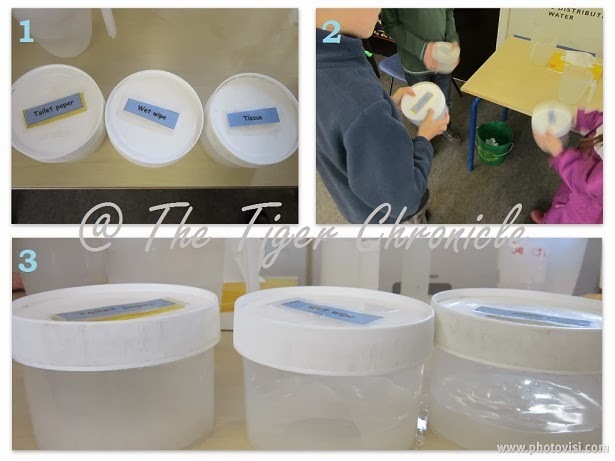 A piece of different material (toilet paper, tissue paper, wet wipe) was put into each pot. The pot was then sealed and the children shook each one vigourously for 5 minutes. 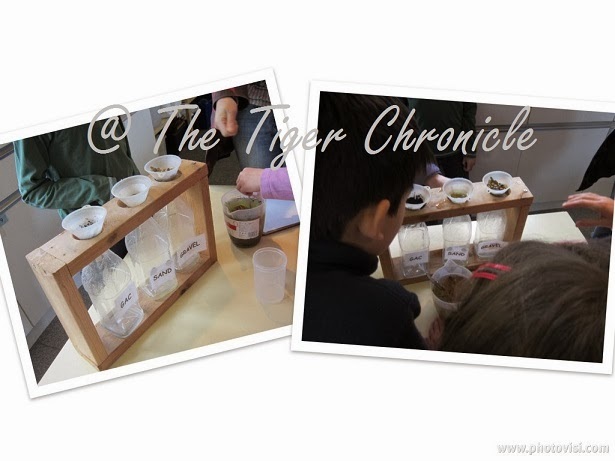 The children then examined the contents of each pot to see the different degrees of disintegration that has occurred. We found that the toilet paper broken down the best, followed by tissue paper. The piece of wet wipe did not break down at all. 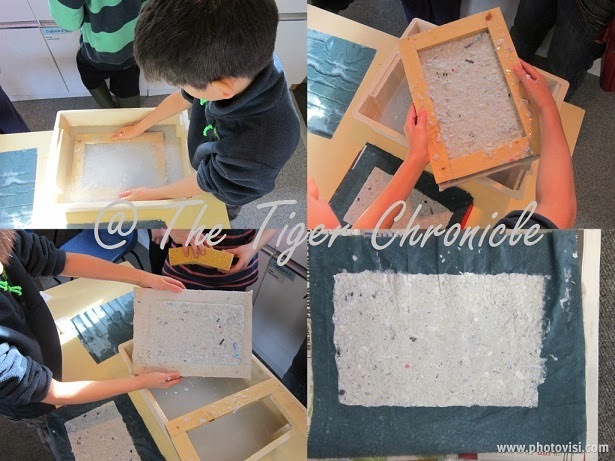 The children also had a go at paper making using torn up pieces of waste paper. Thank you, Fiona. I think learning science through visual, hands-on activities is the best way forward for children. Science concepts tend to stick better for my son when he learns them through doing, rather than through reading. We had trouble doing the supercooled water experiment, too. It is nice to know that it is hard. I love all of your activities!! That second video is brilliant! The man is so helpful, both with the scientific explanation but especially with his explanations. Fantastic set of experiments - thank you! Those sound like awesome water experiments! We had an unintentional water experiment this week when a water bottle froze and burst in our car! These are really cool! I love finding helpful things at the thrift store, looks like you found a true gem! Your field trips are second to none. I do wish we got out a little bit more than we do, my guys would just love all the learning experiences you are giving Tiger. I know! Charity shops are just such treasure coves! I think you're doing a brilliant job with your children, Claire. I often look to your lessons with much admiration. These are fantastic science experiments!! Loved the logical progression of the home experiments and was inspired by how you furthered understanding through real-life applications via the field trip. Brilliant! I also wanted to leave a comment on your blog (but can't find the comments button) about how much I like your post about how you're doing maths with your children. I am big fan of how maths is done the Montessori way, but the costs of materials and albums are quite prohibitive so these days I do much adaptations to how I introduce the concepts. That's a great collection of experiments.